i need a boost of positive energy after the day i've had (tales of troglodytes and deeply unprofessional and unserious and manipulative behavior, which i will process a bit more for myself before i share), so i would like to share an amazing project i'm going to be part of at the beginning of march. it's called kvindeportrætter (women's portraits) 30 women (some artists, some not) will gather and make a plaster cast of our very own torsos. 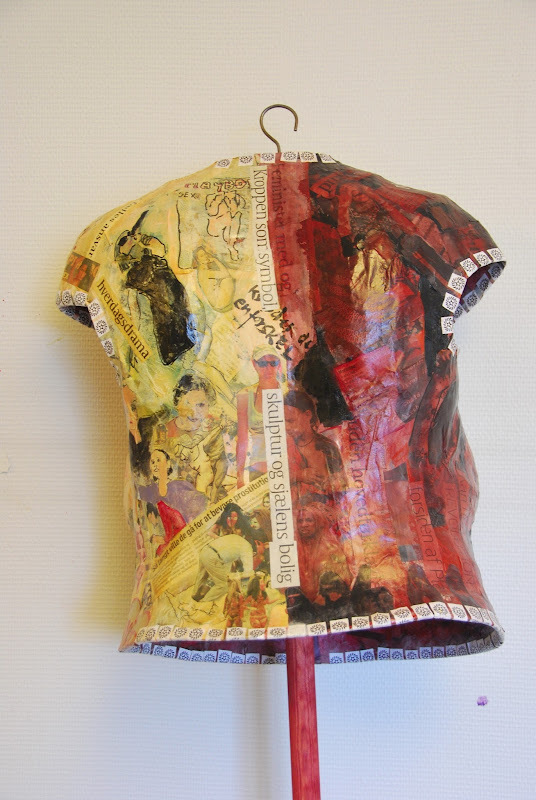 afterwards, we will decorate them as we wish - collage, paint, whatever - telling the stories of ourselves and our lives. aside from the torso mold, which makes me a little light-headed when i think about it (there will be nowhere to hide), i can't wait! it's running in the back of my mind, the things with which i want to adorn my own torso - tickets i've been saving, interesting articles, snippets of text, something along the lines of a gift i once received from a friend, perhaps some stitching or stones or driftwood. it feels delicious with possibilities. and the sense of community of two days spent with like-minded creative women - just the thought of it gives me a sense of calm and a feeling of happiness that i was much in need of at the moment. 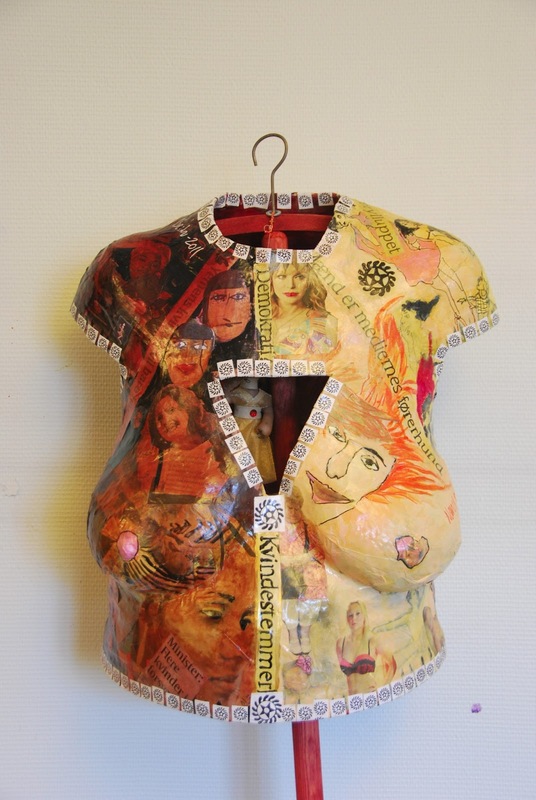 this torso in the photographs was made by the woman who will lead the project. she did it in the context of an art relay - where they artists were to make a piece of art, then send some piece of it on to another. they would also receive a piece of another's art and have to incorporate it into theirs. the triangle in the center was what she sent on. and the little doll hanging inside is related to what she received, as is the red color of the inside. she said there wasn't a single piece on it that isn't laden with meaning. i'm so happy to be finding the artistic community i was missing. i will share more once it gets underway. the results will be exhibited locally and in a real art museum. but more about that as it happens. in the meantime, here's the pinterest board where i'm saving my inspiration. Love it. A memory board of sorts, should be a very interesting process. This is kind of weird. I got three mannequins before Christmas of various sizes (one pregnant) because I wanted to create a project of women's torso to show the various spectrums and "colors" we as women are and show. I wish I was where you are and I could be part of your project! @celkalee - it is a memory board of sorts, but i was thinking of incorporating some kind of future thinking/writing is the new praying as well. Oh yes. What a cool project. Like removing the armor. Can't wait to see what you do with it, j. I know it will be utterly fantastic. Yes! That is totally awesome. And brave! I can't wait to see the end results. I keep thinking of your great great grandchild looking at it someday (because of course it will be a family heirloom)and thinking "this is exactly who Julie was". Or the beginning of a generational project, where the daughters of your family create torsos at exactly the age you are now, and someone in 2213 has this really cool exhibition. This looks like so much fun - but how will you get everything about you on one torso? Are you allowed to do two?